Located on 30 wooded acres, our inviting hotel offers the perfect mix of southern hospitality and modern amenities that make you feel right at home. Largest resort motel in Eureka Springs, and with the largest pool. We offer 122 rooms, including standard rooms, upgrade rooms with balconies, two-room suites, and rooms with Jacuzzi for two. Myrtie Mae`s Restaurant is a local icon, and locals eat there. Extensive recreation facilities including, pool, hot tub, game room with miniature golf, video arcade, ping-pong and pool tables. Game Court. Complete convention, meeting, reception and reunion facilities. Conveniently located for access to all major attractions. Trolley stop on property. NEW covered SECURE motorcycle parking available outside your room. 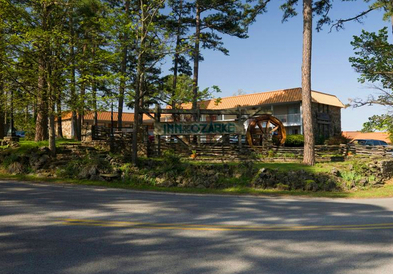 Ask about our Eureka Springs, Arkansas Motorcycle Package!